Early morning – where are those bass? Sight Fishing, Follows and Lost fish! I cannot recall a season when I have witnessed so many bass at close quarters. I wrote a few months ago about a session where I saw four fish (two of them huge). And on three separate occasions now, I have seen pairs of bass in very quiet coves, in only a few inches of water. But have I, or my clients managed to catch these particular fish? No is the answer! Moreover, it has also been rather frustrating to witness so many ‘follows’ from bass despite being as far out of view as possible. One more moan! Bass coming unstuck after being hooked and played for a few seconds – up to a few minutes – especially at night. However, despite this, my client’s and I have managed to catch some nice bass on the lures during July. Very ‘bassy’ conditions but they just didn’t appear during this session for a determined client. Alun lives in south Devon himself and is coming up to retirement therefore, one of the things he wants to do a lot more of is attempting to catch bass, from the shore on lures – hence his friendly email to me. On the day itself, the conditions were excellent for the stretch of coast I had earmarked – decent clarity, regular 2ft waves and a flooding tide. Alun had booked my services for a 4 hour session and was very keen to learn about lure selection and watercraft – both of which were covered as I guided him around various rock marks whilst utilising a number of different lure types and patterns. 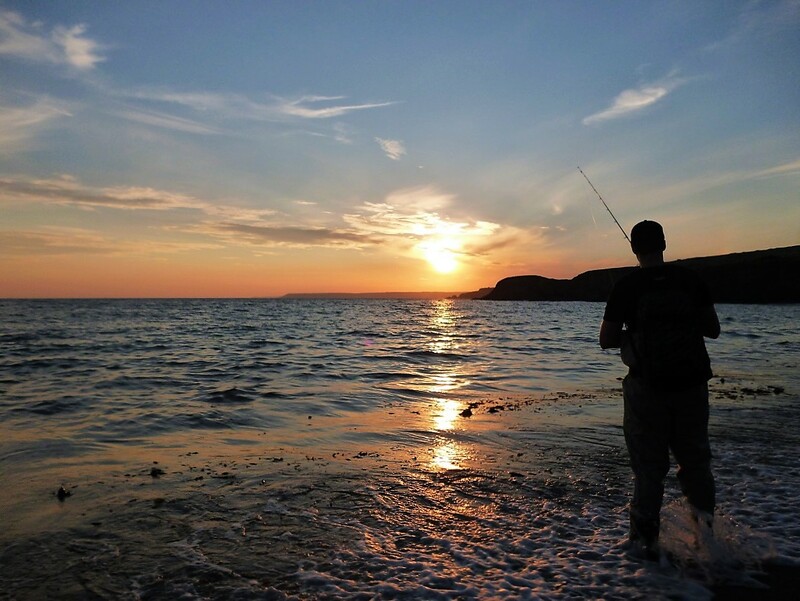 Ultimately, it was Alun’s determination, the reduced light levels of dusk and the decision to fish the beach on our way back to the cars that resulted in the bass below. It wasn’t huge, but welcome and just deserts for Alun’s perseverance. Another angler (and guide) Paul ‘Bassman’ Gordon is in the distance. He had a bass follow to his feet – something that is happening far more regularly this season than any other… very odd. Casting a lure from a beach in a moderate to rough sea very often pays dividends. Next up were two cracking blokes from Kent who were on their way to Cornwall for a week’s camping and fishing holiday. They had left home at 0200 in order to meet me a remote village for a 0730 start – that is dedication. Fishing soft, weightless, weedless plastics before the wind increased, Keith had a strong hit at the end of the retrieve over a shallow reef but unfortunately the fish (bass?) didn’t hook up. Later in the 4 hour session, the wind (crosswind) and cloud really increased and Simon latched into a fish (again a bass?) from the beach itself in no more than 12″ of water but rather annoyingly for him and me, the fish escaped. The session was a huge eye opener for the pair, and they went away with the technical expertise to effectively ‘work’ a variety of lure types alongside the knowledge required to tackle their own marks back in the South-East. I look forward to hearing about their catches of bass on lures in the future (Thank you for the review on my Facebook business page Keith). Top blokes! They really deserved a bass as a reward for their 0200 start! Guiding three clients for a 4 hour session was something I was really looking forward to – as the dynamic (the banter, stories and experiences) is an enjoyable aspect and part of what these sessions are about. 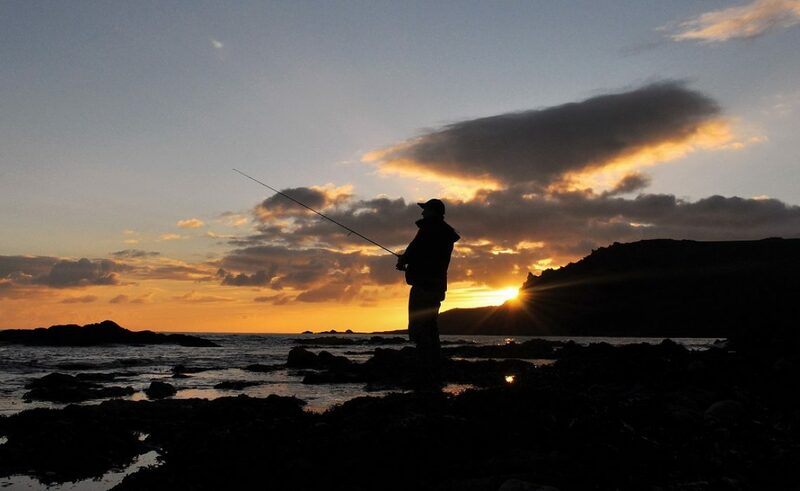 A high percentage of my marks are suitable for up to four anglers to fish safely (even from the rocks unless it’s too rough) and it certainly keeps me on my toes rotating, advising and assisting each angler in turn – I really enjoy it. Primarily, Rob and his friends (who were all staying at his place in Cornwall for a week or so) wanted to confirm that the areas they had been searching for bass (during their yearly fishing jaunts) were correct, in addition to picking my brains about lure selection for various scenarios – be it the actual terrain they were fishing over or the sea, tide and wave conditions. Essentially, they had really struggled to catch a bass on a lure from the shore and were extremely eager to learn as much as possible – the perfect students if you like. Following a fair old scramble out across the rocks, on the very first cast, Rob’s rod pulled over as his paddletail lure was being bumped along the sand literally under his feet in 7ft of water – but the bugger came off just as it broke the surface! Sometimes, when you hook a fish first cast that is the only one you’ll see for the rest of the season and yes, that is exactly what happened. However, a text a couple of days later from Rob brought a smile to my face – they had all caught a bass each from the rocks near to his holiday home, and had in fact lost two others that he reckoned they would have landed if they’d had a net. A ‘team’ photograph for Rob and his mates – it was great to hear they’d all caught bass on a lure from their own patch, following their session with me. Rob, concentrating hard whilst working a lure over a patch of shallow reef. Admittedly, not a double figure bass! But it didn’t matter to my next client Ron (a neighbour of mine) who was actually my first ever client back in September last year. On that day he’d caught a beauty of around 3 lb here. A keen angler, Ron had never heard of bass being caught on lures at night and was therefore intrigued and excited to try it for himself. Following an adjourned session, a week later we were out on one of my favourite night fishing venues on a blustery evening. Your joking! Was his response to the 150mm needlefish that I held in my hand as I relived the stories of recent bass catches for previous clients… And they take a white worm as well at night? Yep, they certainly do and within 10 minutes of the tide ebbing (following 30 minutes with the odd knock) Ron was the proud captor of two bass, both in the 2.5 – 3lb range. To say he was completely gob-smacked is an understatement! The fact that both of his bass had taken the needlefish lure around 6 – 7m from dry land (a shingle beach), in barely 1ft of water was something that has really got him thinking about how and where he’ll fish in the future – marvellous stuff. The smile says it all – chuffed to bits I think! No it wasn’t a fluke Ron – they really do hit lures that close to your feet at night from a beach! Wrasse by day – lost needles (and bass) by night! A cloudy day, all day in the South-West of England said the grinning weather Lady… Hmmmmm… well it was misty and cloudy for the first hour of the session with Nick before we had to rub in the Factor 50! And in the end, it was a decent wrasse on pure attack mode that grabbed the lure. But it was a real treat to see it swim right up behind his weedless shad and absolutely smash it – practically on the surface, before putting up a tremendous scrap that made the day. The wrasse took this Fish Arrow Flash J 5″ rigged on a weedless 4/0 ‘twist-lock’ hook with a 4g belly weight incorporated. For my next guided session, I was joined by Phil and Rich – two very experienced and successful anglers; especially when it come to bull-huss in Phil’s case and trout in Rich’s. I had earmarked a very rugged stretch of coastline for this session, as it was relatively calm and clear on the evening in question. Subtlety (with lure choices and methods) was the way forward while it was light, which was something they were eager to experience as essentially; they both had a common objective – they knew they been doing something wrong, but they couldn’t quite put their fingers on it. Although they didn’t land a bass, Rich had a savage hit on a needlefish lure from a tiny cove that we’d waited until darkness to fish but, very unusually for a bass (I’ve only caught bass on these lures) it grounded him – resulting in the line snapping when neither of us could budge the fish. Well what can I say about my first guided session last night? Fantastic, fantastic, fantastic…. From the first moment I meet Marc and fellow angler Phil the learning tap was well and truly on! I am an experienced sea and trout angler but the whole lure fishing for bass thing had sort of passed me by. I wanted a session or two with Marc to learn as much as I could from the basics up, and I wasn’t disappointed. The guy is a font of knowledge on lure selection, watercraft, choosing locations, tackle.. the list goes on. One of the most important parts for me was learning how to select a mark and select the right types of lures for that mark and conditions, and finally how to work the lures effectively. Some of the things I was shown were mind-blowing purely on the basis that I would never have even considered using those techniques without being shown. Once Marc explained the theory behind it, it made total sense. I cannot even begin to describe just how good the guided session I had with Marc was, suffice to say I will be approaching my lure fishing with a totally fresh and confident outlook going forward, and will certainly be booking my next session soon!! I spend a fair chunk of money on tackle, as I’m sure a lot of us do – when it comes to lure fishing for bass this was without doubt the best money I have ever spent, just wish I’d done it sooner!! Thanks Marc for a professional, tailored, and thoroughly enjoyable trip!! P.S sorry I lost the “Jim” lure! Phil, rotating through the lures towards dusk – surface, weedless shads and senkos, and shallow diving minnows were all used. Rich, slowly twitching and slow retrieving a weightless weedless shad as dusk sets in. As I’ve previously mentioned, I have earmarked a number of marks that I am periodically ‘testing’ at night with my prospective clients in mind. All but one has yielded bass to either a white senko, a needlefish, a surface lure or a shallow diving minnow. Furthermore, they all have the same thing in common – shallow, weedy/rocky with lots of life present at low tide under the rocks – that I can reach when casting from a shingle beach/cove over high tide. I do a have a number of low tide marks in mind and areas of pure sand that I’m really looking forward to testing out at night – more on that in the coming months. A 60cm + bass taken on a white senko over a shallow reef – a lethal method. Probably the smallest bass I’ve caught on a needlefish as they tend to sort out the big who are generally hooked on the middle treble – probably when they ‘side swipe’ the lure. Catching them from a beach on a starlit night takes a bit of beating – I have a serious addiction that will only worsen! My next client was Chris – a total Gentleman who again, is coming up to retirement and wanted to enhance his levels of lure fishing expertise. The session was split into 2 x 4 hour sessions on the same day (with an evening meal in a local pub during the break which was very nice indeed!). I’m here to learn’ was Chris’ mandate for the session and that he did as the tide ebbed as he fished the first session – uncovering the ground that he would later fish into darkness; or so I’d hoped… During the first session we tried areas with a fast-moving current and then shallow reefs – rotating through the lure types but the bass simply weren’t playing. The way the wind had dropped and the sea flattened out, it spelled one thing to me – wait until darkness which we duly did with brief periods of cast and retrieve into some quiet areas as the tide began to flood. Why so brief? Because Chris’ back had decided to give up on him just as I the session was about to get really interesting. Chris, fishing in pain. Such a shame his back gave up on him – but seeing a fish caught can equate to confidence in a method. The sea conditions (flat calm and crystal clear over high tide) spell bass at night to me! I can be pretty persuasive! But not even the near promise that he would catch a bass once darkness set in was enough to convince him to carry on. No problem at all mate, I said, we’ll head back to the cars – No way! ‘I want to see you catch a bass on one of those needles’ was his retort… Grinning, he hands me his very nice and very expensive 7′ 6″ Yamaga Blanks rod whereby I trudge off a few yards into the gloom. 20 minutes later and I get hit on the needle only 5 metres out – but no hook up. Unbelievably, it’s over the shallowest part of the reef and barely 6″ deep but I make another cast 10 metres out in the hope that the bass is still in the area… As the lure is nearing 3 metres from the beach I get a weird tap, tap, tap, tap sensation before the bass realises it has bitten something that isn’t what it thinks it is and decides to head out to sea. Pulling line off the drag and putting an alarming bend into Chris’ rod as it does so, before I can carefully manoeuvre it back towards the beach. Head torch on, I carry the 4.5lb bass over to Chris who is still grimacing in pain. ‘Wow! I really didn’t expect to see a fish like that!’ Next time Sir, you’ll be the one holding a beautiful lure caught bass – and the next session will be at a very discounted rate for allowing me to fish during the final hour of your session. This one’s for you Chris! Cheers mate! Returning these majestic fish is a special moment and something I’ll never take for granted. My final session of the month was with the sea/lure fishing nut/enthusiast that is Boyan – a young chap who is completely and utterly in love with being out on the coastline – with lure fishing for bass being his favoured method (who can blame him). What a shame one of them didn’t attack the lure, and apart from another hit from a fish (most probably a wrasse) on the Do-Live Shad later in the session it wasn’t to be. Boyan, taking in the beautiful sunset along the south Devon coastline. April was a month of follows and lost fish before my luck changed in May/June therefore, I’m hoping the same occurs again! Finding the bass has been difficult at times this season so you feel for clients when they see one follow, or a bass manages to throw the hook – but there is a silver lining. Something very satisfying is happening. I am receiving numerous messages and photographs from former clients who have gone away with enhanced knowledge, levels of expertise and importantly – renewed confidence, and they’ve been catching bass on their own patch. Furthermore, anglers who I’ve never met, but who I have advised (via Messenger/Facebook/emails) are sending me photographs of bass taken from new marks, or places they had previously dismissed. Brilliant stuff therefore, I aim to write a future blog post all about these catches, utilsing their photographs in the coming weeks. Next Guided Bass Fishing – August arrives with a bang!